The world’s oldest surviving human rights artifact was possibly shaped by the Persians in 6th century BC, via the Cyrus Cylinder. Well, another crucial ‘humane’ achievement of human civilization had remarkably made its head start 900 years before Cyrus ceremoniously had his famous cylinder inscribed. We are talking about the Edwin Smith Papyrus, a comprehensive medical text on surgery from Ancient Egypt that was written around 1500 BC. It is perceived as a treatise that deals with mainly trauma, and predates the famous Hippocratic Oath by almost a thousand years! The Edwin Smith Papyrus is named after the American Egyptologist, who purchased the valuable document way back in 1862, at Luxor, Egypt. However, beyond its latter history, it is the valuable content that holds significance for archaeologists and medical professionals alike. To that end, the treatise exclusively contains only cases, and not recipes for treatment of various traumas. These 48 cases are arranged in an immaculate manner with consideration to the location of the injury. In other words, the injuries mentioned proceed systematically from the head down to the spine, much like any of its modern-day counterpart. The cases even individually comprise of the sub-categories that are divided into the title, examination, diagnosis and finally the treatment. The astonishing part is how the organized state of affairs is equally complemented by the rationalized inputs of treatment. Quite possibly, the treatise may entail the first historical mentioning of ‘brain‘ in any language. In this regard, many contemporary neurosurgeons (with the help of historians) have actually identified the descriptions of various brain-related sections like cranial sutures, the meninges, the cerebrospinal fluid and the intracranial pulsations. Furthermore, the treatment processes encompass realistic solutions like surgical stitching and different types of injury dressing. And, what is even more baffling pertains to the hypothesis that the papyrus was actually a ‘not-so-well-made’ copy from a previous medical treatise. James H. Breasted, the then-director of University of Chicago Oriental Institute, ascertained in 1930 that the original source was an Egyptian composite manuscript that was written between the period of 3000 – 2500 BC, probably by the renowned high priest, architect and medicine practitioner Imhotep. According to Breasted, the scribe who copied this ‘archaic treatise’ made many errors and a finally left the Edwin Smith Papyrus incomplete. Thus we only see the traumas and their treatment coverage ranging to the spine, and not the legs. 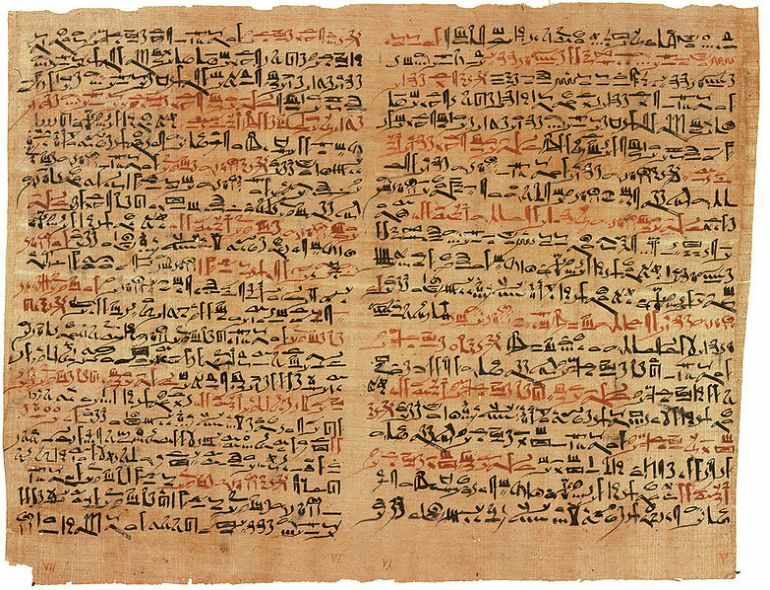 In spite of the alleged ‘derived’ knowledge, the Edwin Smith Papyrus remains an important piece of historical document that gives us a fascinating perspective into the advanced Egyptian level of medicinal knowledge. So, it comes as no surprise that the analytically sagacious content matter is generally considered to be more progressive than even that of Hippocrates’ discourse – the ancient Greek physician who is better known as the father of medicine in Western cultures.